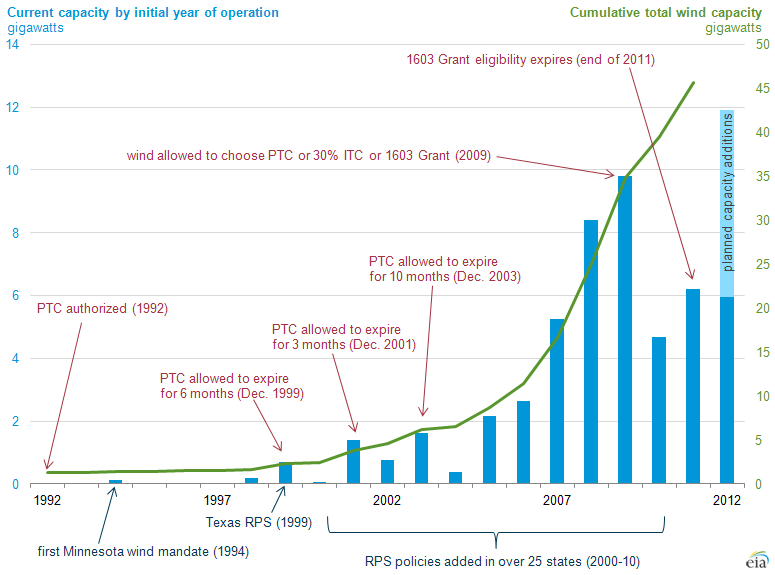 The chart below comes from RealClearEnergy, a broad spectrum energy news and commentary website. 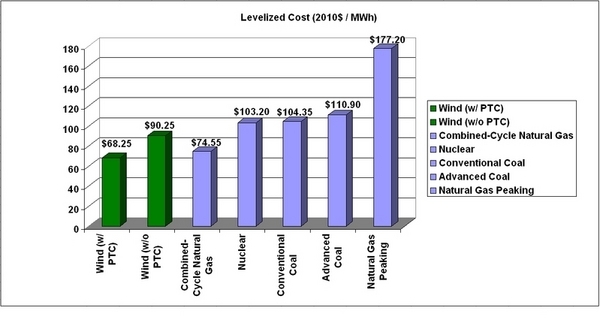 It is a comparison of "levelised costs" between various types of energy sources -- including wind "power" with and without the US federal PTC price support. The article admits that wind is only "competitive" when it operates a maximum capacity, and that wind "cannot always operate at maximum capacity." The authors of the editorial deserve a "comic of the year award" for stating the above with a straight face. Wind is unpredictable, and rarely operates at maximum capacity, and when it does it is usually at a time when the grid does not need the "power," forcing the grid to buy unneeded energy and dump it (waste it) at significant expense. That is a key point. The unpredictable intermittency of the wind destroys any price advantage it may present on a constructed chart -- with or without a PTC. Modern industrial infrastructure is designed around affordable, reliable, high quality electrical power. Big wind energy is the enemy of affordability, reliability, and quality of power. At best, windmills generate electricity only one-third of the time. That means to get the real costs you have to combine the $90.25 or $68.25 figure with something else. The choice today is peaking natural gas generators, since only they can be ramped up and down to match wind’s variations. But when you combine the weighted costs of natural gas peakers and wind without the production tax credit you get $148.22, far more expensive than coal or nuclear. Even with the production tax credit, the cost remains at $104.50, slightly higher than nuclear. Now General Electric is now marketing a combined-cycle plant that it says can be ramped up and down to partner for wind. But if combined cycle is already $15 cheaper than wind without the production tax credit, then what’s the sense of adding windmills? Even with the PTC, the differential is only $6, which is hardly worth the effort. The wind industry in the US and elsewhere in the modern world, cannot survive without massive government subsidies -- which invariably go to wealthy investors and developers. Most of these investors and developers are closely connected to ruling interests inside of government, for some odd reason. The above chart gives one an idea of how dependent big wind is upon big government tax loopholes to wealthy and well-connected lobbyists, developers, and financial interests. It is time to stop lying and obscuring the brutal truth about intermittent unreliable forms of energy. Wind power is an ancient source of energy, but it has not adapted well to modern industrial power needs, and it never will. The attempt to square the circle in this situation is the result of a blind adherence to a faux environmental, pseudoscientific quasi-religion known as catastrophic anthropogenic global warming. We at the Al Fin Institutes refer to this superstitious belief as "carbon hysteria." Until the irrational fear of carbon is eradicated from media, government, academia, and faux environmental factions, these groups will continue to promote irrational, counter-productive, unreliable, and non-economic forms of energy to replace a current system which is in need of far more rational upgrades, for the money that will be spent.